What is palm muting and how do you play palm muted parts? Every month, Guitar Techniques attempts to answer guitarists' playing posers and technical teasers with expert and practical advice. Here we go back to basics to explain a much-used playing technique: palm muting. What is 'palm muting'? I keep seeing it referred to in GT. When playing rhythm or lead parts, it's sometimes necessary to try and restrain the guitar's natural tendency to 'ring on' once a string or collection of strings has been sounded. This is where the edge of the right hand palm comes in... handy. 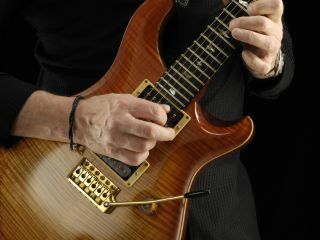 Lightly rest the 'karate chop' edge of the picking hand on the strings near the bridge; effectively muting the strings slightly and so controlling the sustain. Try this simple experiment: rest your palm's edge lightly in front of the bridge and play the open strings. The pressure with your palm should be enough to let the strings ring but not enough to mute them completely. Now experiment with the pressure of your hand so that you hear everything from ringing strings to a dull thud. These are the parameters that you'll work between when using palm muting. Sometimes you'll just want to take the edge off a ringing chord and sometimes you'll want to cut it dead.